The wines and cider were for the people who weren't the greatest fans of beer, and the Kona Pipeline Porter (a coffee porter) was sort of a dessert. We all had plenty of good food to share with the beers too and sat around making ratings on each beer by a democratic vote. 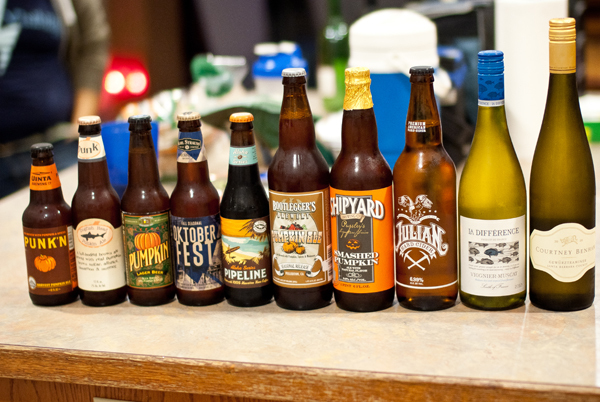 The best beer of the evening voted with hearty cheers and "hear hear"s by everyone was the Shipyard Smashed Pumpkin. Well done, you flavorful wonderful pumpkin beer. Next up was probably the Bootlegger's Pumpkin Ale but only with pumpkin pie, which we had. The Lakefront was good too. The Uinta was a smidgen too heavy on the spices so it wasn't a crowd favorite. The Freaktoberfest was decent but not all too memorable, and the Karl Strauss Octoberfest was fairly basic. As for the cider, very delicious and of the wines, the Gewurztraminer was the better of the two. Overall, a fantastic night and another success to cherish and use as proof to have more tasting nights!